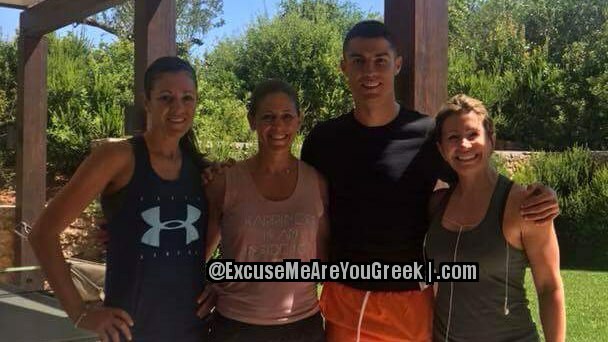 [Photo] Cristiano Ronaldo in Greece at Costa Navarino | Excuse Me, Are You Greek? News broke that Cristiano Ronaldo is in Greece at the world famous resort near Kalamata, Costa Navarino, while he tries to determine his furure and which club he will play with. He flew on a private jet to Kalamata, and then took a helicopter to the resort. However, there’s a news blackout and a 200-foot perimeter around him at all times, so no photos have surfaced – until now! Who would have figured that someone I grew up with would be the one to get a photo with the soccer star?!?! Stefanie Gatsinaris was working out at the resort gym when Ronaldo appeared, looking to work out as well.